Product #60797 | SKU LSD64GCBNA1667 | 0.0 (no ratings yet) Thanks for your rating! 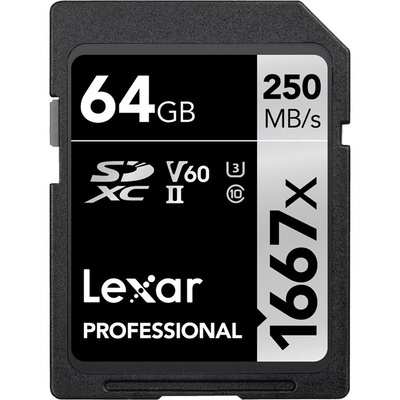 The Lexar 64GB Professional 1667x UHS-II SDXC Memory Card lets you quickly capture and transfer high-quality photos, including 1080p Full-HD, 3D, and 4K video, with a read transfer speed up to 250MB/s (1667x). This card leverages UHS-II technology (UHS Speed Class 3 (U3)) for high-speed performance. This dramatically accelerates workflow from start to finish. Using a DSLR, HD camcorder or 3D camera, you’ll be able to leverage the latest photo and video features available for shooting high-quality images and stunning 1080p Full-HD, 3D, and 4K video. With growing HD, 3D, and 4K video capabilities, you need high-performance cards you can rely on, and high-capacity options to keep you shooting longer without changing cards. The Lexar Professional 1667x SDXC UHS-II card makes it easy by leveraging UHS Speed Class 3 (U3) performance.